For one who naturally inclines toward dark brooding, these are not good times. But then, if people follow the news and keep themselves reasonably well-informed about our headlong plunge toward environmental and climate disaster, I cannot imagine too many being in a celebratory mood. Except perhaps in Ontario, where the populace turned its back on anything resembling responsible and mature government by electing Doug Ford and his 'Progressive' Conservatives. The premier-in-waiting has declared an end to carbon pricing in Ontario — no cap and trade, no carbon tax, no fuss, no muss, no nothing. No matter. Never mind Earth’s rising temperatures. Ontario’s gas prices are coming down, and that’s a Ford promise (forget rising world oil prices). Ford vowed in the campaign that he is “for the people.” His victory surely proves his grasp of the political environment — if not the planetary one. Win or lose, he triumphs either way. If the federal carbon tax is upheld and imposed in Ontario, Ford will earnestly claim that the devil (the Supreme Court) made him impose the carbon tax dreamed up by that other devil (Prime Minister Justin Trudeau). The Thirty Million Dollar Man will cast himself as the Thirty Million Dollar Martyr. And what about the money from the cap-and-trade that was used to combat climate change? Gone. The program’s website was been reduced to one page Tuesday. Under the headline “The following programs are closed,” the site now lists everything from residential solar, window and insulation rebates to smart thermostats and programs for businesses. Also about to be terminated are the rebates for buying electric vehicles, which paid out as much as $14,000 to defray consumer costs and encourage non-polluting transportation. As my literary hero Hamlet said, "The time is out of joint." 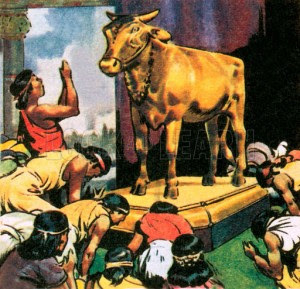 Too bad so many are busy worshiping the golden calf to notice. Stupidity has gone viral, Lorne. We seem intent on doing ourselves in. Perhaps, when all is said and done, Owen, we are a world of masochists. I read an item recently noting that, to the commercial sector, grandchildren don't exist. The next generation or the one after that, they're irrelevant. The political caste is supposed to take us beyond this commercial sector myopia but the neoliberal order instead embraces it by putting factors such as GDP growth at or near the top of its priorities. The future won't be voting in the next election. And yet, in the next election, those turning out will probably vote by a margin approaching 80% for either Trudeau or Scheer. In this we don't merely condone, we utterly legitimate their short term focus. That, of course, brings us to the theory that all intelligent life is ultimately self-extinguishing. All the cards appear to be stacked against future generations, Mound. Our refusal to think of them, on both an individual and a collective basis, is reprehensible and probably ultimately fatal. Its becoming increasing hard to not become depressed when one 'keeps up' with the news Lorne. I admire your fortitude in bringing the collective decent into a dark future to our attention, I find myself wishing I could avoid such news but than is not possible for those of us taking any notice at all ! Some days I feel like giving up doing this, Rural, but then I seem to recover my spirit sufficiently to post once more. BTW, I left a comment on your Sunday post, but I wonder if you didn't see it. The only way I now see comments on my blog posts is by going to the dashboard and looking under "comments awaiting moderation." I am no longer receiving notification via email, and I wonder if you might be having the same problem.